I TAUGHT MYSELF TO MAKE CONCRETE. I LEARNED TO RUN A BIG BACKHOE. This precocious young driver is living a kid's dream to drive all the big machines. From combines on the farm to firetrucks at the rescue, big-rig kings of the road to bulldozers at the construction site, this kid grows up behind the big wheel. No machine is too big for him. A HUGE JACKHAMMER? WRECKING BALL?BULLDOZER, TOO? I MANNED THEM ALL! From hay bailer to street paver to snow plow, he's the master of them all! WHEN I GROW UP..., YOU KNOW WASSUP? WITH ANY LUCK I'LL DRIVE A TRUCK! 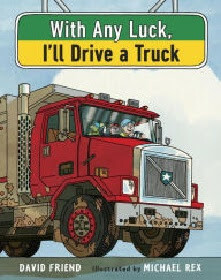 In his first picture book, With Any Luck I'll Drive a Truck (Nancy Paulsen Books, 2016), author David Friend drives the narrative with his rhythmic couplets, covering quite a catalog of all those monster movers that are every kid's dream machines. And dream machines they are, as on the final page readers will see the would-be wheel man in his bedroom, surrounded by all his toy vehicles. And riding shotgun with author Friend is noted artist Michael Rex (for his best-selling Goodnight Goon: a Petrifying Parody, and Furious George Goes Bananas: A Primate Parody) who skillfully mixes cartoons of our young easy rider and his critter good buddies, with realistic and highly detailed illustrations of all these rigs. For the preschool and primary set who dote on heavy equipment, this is just about the best vehicle book there is. "A delightful ode to trucks goes above and beyond the usual churning, wrecking, and pounding," says Kirkus in their starred review.